I love Bandcamp. I love it in the same sort of manner as I love watching an FA Cup match between a Premiership team and lowly Smeghampton Academicals of the Smiths Fish and Chip shops 12th tier reserve league. I love it in the same sort of manner as I love to watch my slightly pubescent eldest child navigate faltering steps at 'chatting up' or 'sharking' the latest recipient of his clumsy affections. I love it in the same manner as you simply have to watch the plucky little neighbourhood nutter have a pop at the biggest granite chiseled oaf in the pub, just because he dared to look at his pint in a somewhat skew manner. I love Bandcamp because, just like Smeghampton who ordinarily get hammered 11-0, just like my son getting sent packing by his would-be beau and just like the bloodied pub nutter 'David' getting battered by a tattooed Goliath, the bands submitting music to Bandcamp always show heart and more than occasionally an absolute musical nugget emerges from such honest endeavour and you allow yourself that smug 'discovery smirk' that justifies the merits of your recent 19 hour trawl through the Bandcamp new arrivals. 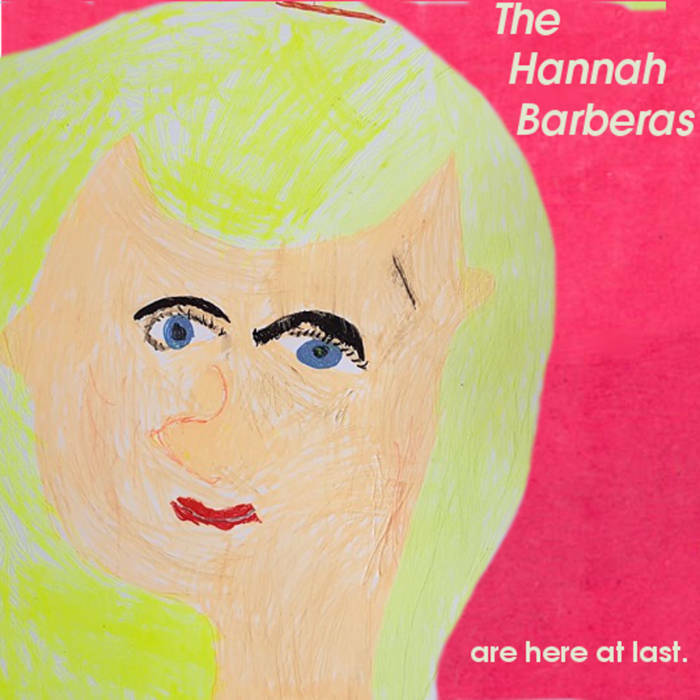 This EP from The Hannah Barberas transformed that self satisfied smirk into a complete 'oooh look at me' grin as it signals a band with genuine potential to become the next big thing within the strange internet universe that is the blogosphere as it all just kind of fits together properly. Initially the name and the cover work appeals. The name promises the sort of indie-pop twee cuteness that bands with a will to remain 'indie obscure' convey with their cool appreciation of cultural significance. For Hannah Barbera animation studio that is responsible for the Flintstones, The Jetsons, Smurfs, Scooby-Doo, Wacky Races could not have any more 'cool significance' if it was owned by Quentin Tarantino. Such en vogue indie appeal also extends to the presumably band drawn 2D cartoon cover art of a woman's face that is expertly bad. However that is really where the acute awareness of indie chic and twee-isms end. For once the music of this three track EP actually starts, it is a vastly different and altogether more cultivated and perfected aesthetic. The EP's best track (see above), Now (is Here at Last) , has a dominant chunky rumbling bass line which is typical of all three tracks and invites comparisons to any number of early to mid 80's UK post-punk bands. However that is where all things post-punk ends within the track as it takes on its own inimitable tactility by weaving fragile, yet beautiful jangled guitar work into the musical fabric, whilst keeping these two antagonistic positions together via the sort of deliberate, slightly dead-pan mid 90's Brit-pop vocals (think Echobelly / Sleeper, but prettier) of Lucy Formoli. It truly is a unique 'made for indie' sound and the best of the EP, despite strong competition. The opening track, Our Girl is Gone (see above), also has that rumbling bass line. However a different angle of jangled indie-pop is utilized. Here the male vocals and frenetic pace of the track imbue the sort of fragility and anxiety that the The Feelies or the Modern Lovers at their least manic exuded. The track presents an appealing race to a conclusion in the same way that so many of the better early 80's agit indie-pop bands conveyed. The final track of the EP sees THB become a tad playful in the introduction to their cover version of McCarthy's Red Sleeping Beauty, with a sample of what appears to be a comedic ant-conservative sketch, applied as an introduction to a cover that is relatively faithful to the original. However, there is just that little bit of extra allure as the vocals are more fragile (in the best sense of the word) and less glorified than the original. Perhaps McCarthy without the 80's production showmanship is the best description? Either way just like all else on this EP, it has that satisfying essence of originality. THB are working on a full album this summer. If this EP is any benchmark the potential for further self satisfied 'discovery smirks' is extremely high...certainly a band to stck on your Bandcamp 'follow' list! Our pleasure...really looking forward to the album !